Shirts With Random Triangles: Jadeveon Clowney caught speeding, receives $355 fine. Jadeveon Clowney caught speeding, receives $355 fine. It seems that South Carolina defensive end Jadeveon Clowney shares some thing in common with Sammy Hagar - they both drive 55 (miles per hour, that is). Clowney apparently can't drive 70, either. That's because he was ticketed by the South Carolina Highway Patrol for going 110 mph while driving in a 70 mph zone. According to Highway Patrol Lance Cpl. David Jones, Clowney was driving a Chrysler 300 when busted for speeding on Interstate 77 in a area 25 miles north of Columbia, SC. Clowney was ticketed, fined $355.00, and docked six points on his drivers license, which is half the number needed to get it suspended. 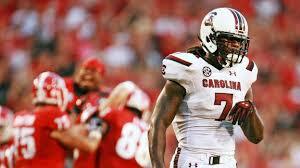 Clowney is expected to enter the 2014 NFL Draft following South Carolina's Capital One Bowl game against Wisconsin on Jan. 1, 2014.